Recently, Serious Eats asked where you would take a tourist if they came to visit you in your town. Some Chicagoans chimed in with places like Great Lake, Kuma's Corner, and Hot Doug's. I'm sure Alinea and Charlie Trotters are on the list somewhere for foodies. That's fine for you city rats, but us suburbanites live in the land of strip malls and minivans. There can't possibly be anything worth eating in Elmhurst, right? If that's what you thought....I'm here to challenge that assumption. Granted, I'm not pointing you to any place that specializes in molecular gastronomy, but it isn't all Burger Kings and Chucky Cheese's out in the Suburbs. Without further delay, here's my list of places you should hit when life brings you to Elmhurst. Seven Ten Lanes Fitz's Lanes Fitz's Spare Keys for their Italian Beef pizza with "extra" giardinera. It really is quite an amazing pie that comes from a bowling alley. Thin, crackery crust cut into squares is what Chicago *should* be known for - not the casserole that we are known for. If you end up at this spot for bowling or dueling pianos, eschew the usual bar fare of burgers/fried stuff and try the pizza. Topped with some ordinary Italian Beef, the giardiniera and the crust make this a winner. Richardson's Hamburger Heaven for a burger and root beer. This is a summer-time only burger stand. They're closed all winter long - so this is food you get during the warmer months only. Maybe the rare nature/lack of availability year around makes it taste better? I'm not sure. This is a basic no-frills hamburger stand. It is literally a "stand". You walk up to the window, order your chow, then wait at another window to pick it up. The wait staff is young and surprisingly grumpy, there is a fear of getting run over by a car as they speed by on VERY close North Avenue, but the chow is more than good enough to make up for the issues. 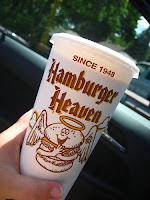 Get a burger and root beer or root beer float. Skip the fries and splurge on the float. Rosticeria los Fernandez for their roast chicken dinner with ranchero beans. This isn't your typical mexican restaurant. I'm sure they have tacos and such, but the real draw here is the roasted chicken. They serve "meals" with a whole bird cut up with roasted jalepenos and long onions. You get a few sides, but avoid the "Gringo" items like mac and cheese or potoato salad. Go with the ranchero beans and dig in. Fontano's Sub Sandwiches for an Italian Sub. Fontano's is home to not one but eight different Italian subs. Various combinations of salted, cured meats plus a generous topping of giardiniera. Might be the best sang-wich in town. Not sure why they have 8 different Italian combos, but I'm not complaining. The place seems to be run by Elmhurst College kids - there has never been an adult in sight when we go in. The only gripe I have with them is that they don't sell giardiniera by the bottle, instead they sell their olive spread and various other bottled peppers -none of which they sell on their sang-wiches. At some point, I'll do a more "fine" dining rundown of Elmhurst. At least for us, these are the places we go to most, so this made sense to start here.